Center of a large market with a population of 2 billion people! 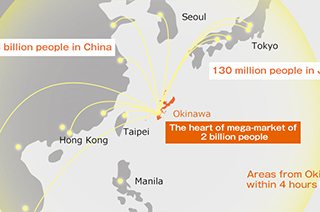 The location of Okinawa - at the center of East Asia, within 4 hours away by air from major cities in Japan and Asian countries - makes a speedy access to the mega-market of a population of 2 billion possible. The handling volume of international cargos at Naha Airport in 2014 was approximately 185,000 tons, which was the fourth largest in Japan after Narita, Haneda and Kansai airports. It marked an increase by about 100 times since 2008, before the hub project began. Business opportunities in Okinawa are greatly growing. Products may be qualified as "Made in Japan" by having them manufactured in Okinawa in accordance with laws and regulations. 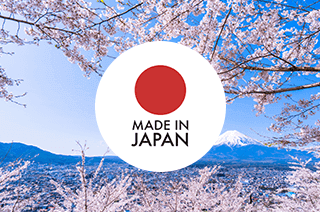 Having products qualified as "Made in Japan" can increase its added-values as Japan-brand products, and with that, strategic promotion of the products to many markets overseas can be anticipated. Further, acquiring Certificate of Origin in Japan can possibly enable businesses to utilize Japan's Free Trade Agreement (FTA / EPA) system, with which more advantageous tax conditions will be applied for exporting to third countries. The closest Japanese "Special Economic Zone" to East Asia and South-East Asia! 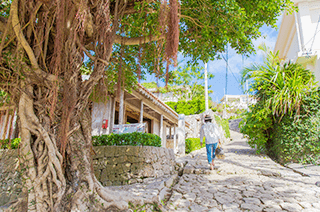 Okinawa has adopted high-rate income tax deductions (up to 40%) and tax incentives to promote facility investments that can not be seen in other prefectures. 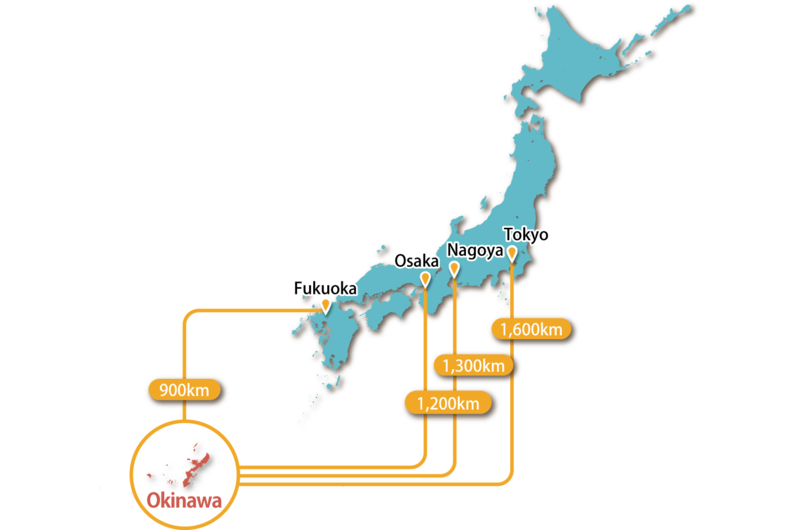 Various special zones or regional systems such as "International Logistics Hub Industrial Cluster Zone," "Information and Communication Industry Promotion Zone," "Special Economic and Financial Revitalization Zone," "Industrial Innovation Zone" and "Program for Tourism Destination Promotion Zones" are established so that businesses in Okinawa will be carried out advantageously. 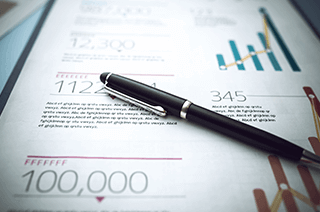 Utilize the data of tourist trends for your market research in Japan's domestic market! Promote your brand for more recognition in Japan! Okinawa is visited by 8 million tourists and 400,000 students every year. 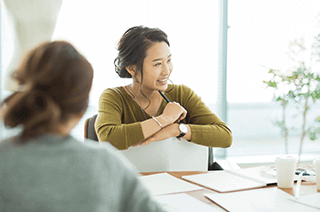 Since hotel guests are almost averaged across all prefectures, cosmetic manufacturers and food companies use this opportunity for market research. Marketing effort also is underway such as development of local collaboration products with popular animated characters and testing new products at specialty shops. By deploying a business in Okinawa - one of the favorite destinations for tourists - your products will gain more attention and you can improve the brand name recognition in Japan and overseas. Okinawa has the highest birth rate in Japan, and a wealth of promising young workers. The disaster risk in Okinawa is low due to its distance from the mainland. In fact, several companies have set up their businesses here because of this reason. It is essential to have a safe, secure and comfortable environment in order to conduct business safely. In addition to the well-acknowledged good public order in Japan, the friendly nature peculiar to Okinawa welcomes those foreigners coming to Okinawa warmly. Various international events are organized at the International Exchange Foundation and JICA Okinawa, and all families are welcomed to participate. Also, the rich culture of Okinawa contributed to 9 locations on UNESCO World Heritage List. Operation of Naha Airport second runway (scheduled for 2020) and the development plan of a large-scale and high-performance comprehensive distribution center at the Naha Port! The second runway with a total length of 2,700m is under construction at the offshore of Naha Airport, aiming at operation starting in March 2020. 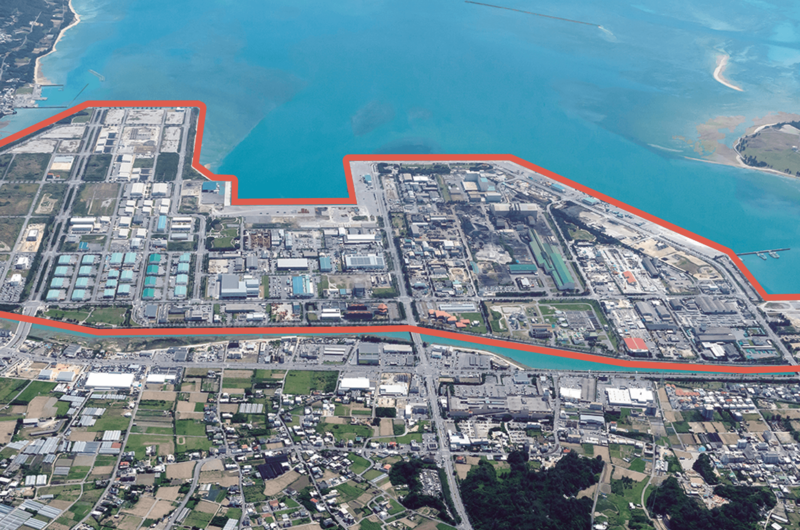 At Naha Port, the development of a large-scale, high-performance comprehensive distribution center is planned. 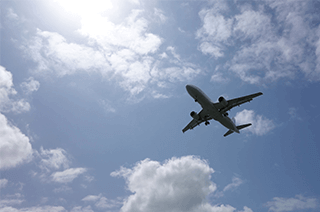 The possibilities of business utilizing Okinawa's sky and ocean will further expand.